Liverpool took a convincing three points from Southampton this afternoon upon Virgin van Dijk’s return to his former club. Mohamed Salah and Roberto Firmino were both on the scoresheet for Jurgen Klopp’s Liverpool side. Van Dijk was booed throughout by home supporters but appeared unfazed with Liverpool securing a clean sheet. 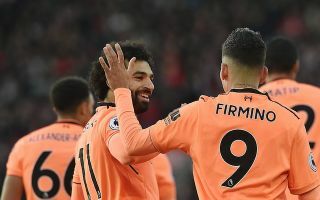 Liverpool took a comfortable three points from their away trip to Southampton with Roberto Firmino and Mohamed Salah both on the scoresheet for the Reds. Virgil van Dijk made his return to his former club after his record-breaking move to Liverpool in January and looked unfazed despite being booed throughout by Southampton home supporters. Roberto Firmino opened the scoring for Liverpool on the sixth minute and then turned provider with a beautiful back-heel to set Mohamed Salah away to score his 22nd Premier League goal on the 42nd minute. While strikers are often idolised for their goalscoring ability, and while Firmino has much of this within his game – it was once again his link-up play that stole the headlines. The Brazilian’s back-heel to set-up Salah’s goal was audacious to say the least. The star now has six assists to his name in the Premier League this season alongside his twelve goals. While still at a young age James Ward-Prowse is now regarded as one of the more experienced stars in Southampton’s squad. The midfielder however looked ineffective throughout despite playing in a pushed forward attacking role. The England star was pulled from the action on the 71st minute after his disappointing display. Southampton: McCarthy 5, Cedric 6, Stephens 5, Hoedt 5, Bertrand 6, Romeu 5, Lemina 4, Ward-Prowse 4, Hojbjerg 5, Tadic 5, Carrillo 5. Subs: Long 5, Davis 5, Boufal 5. Liverpool: Karius 6, Alexander-Arnold 7, Matip 6, Van Dijk 7, Robertson 6, Oxlade-Chamberlain 6, Can 6, Wijnaldum 6, Salah 8, Firmino 9, Mane 6. Subs: Lovren n/a, Milner 5, Lallana 5. Firmino has just wrapped up assist of the season ???? Comfortable win overall. Salah and Firmino incredible. Need more from Mane. Karius improving. Firmino’s finish is underrated. He just picks out the bottom corner with his weaker foot.